with high purity gypsum core, vermiculite and glass fiber additive distributed in net shape. By adopting pink paper back under special fire proof treatment as protective tissue, it will greatly improve fire resistant property of plasterboard. So, it is particularly applicable to partition, elevation and stair passagewayof places with higher requirements of fire resistant property. Baier fireproof Gypsum board Completely conforms to China GB/T9775 standard with its stability over 20 min in case of fire. With gypsum as main raw material, Baier fire proof paper-Faced plasterboard is a kind of board with bonding of protective tissue with core material composed of fiber and additive. Its main raw materials include calcined gypsum powder, protective tissue, bonding agent, coagulant and filler. Company adopts high purity, environmental-protection and de-sulfurization gypsum. Other Size we can according your request. protective tissue are produced with imported equipment and advanced production technology internationally. 2. It is qualified with such features as high strength, light weight, strong nail-holding power, good flatness and low water content. 3. It possesses many types of high performance paper-backed plasterboard like standard board, water proof board and fire proof board. 4. With the addition of alkali-free glass fiber, standard board is made to have certain fire prevention function as well. 5. It is produced in strict accordance with China GB/T9775-2008 standard. 6. 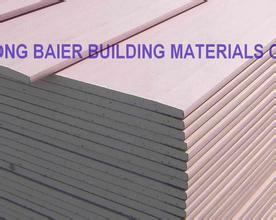 Perfect plasterboard system will be formed under coordinating use with Baier Drywall Metal framwork.